Season in Review: Stankiewicz, a second-round pick of the Mets in 2012, spent a year at Seminole State College after not signing. The move paid off, as the Red Sox selected Stankiewicz with the 45th overall selection. He originally signed for a reported $1.1M, but his bonus was cut to $915K after his physical revealed a minor issue. 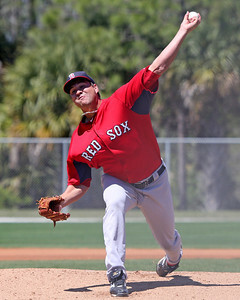 He debuted on July 21 for the Lowell Spinners, and the Red Sox limited his innings by having him work his way up from one to three innings per start. Stankiewicz dominated the New York-Penn League, as he did not allow his second run until his sixth appearance, and ultimately had a WHIP below 1.00 over nine games. The 19-year-old showed impressive control as he walked only two batters over 19 2/3 innings, while striking out 15. Season in Review: Johnson’s 2012 season ended abruptly after he was struck by a line drive on the mound, causing multiple orbital bone fractures. After spending the offseason recovering from the injury, and thus lacking the benefit of a typical throwing and strength-training program, he got off to a rough start in Greenville. The 2012 first-round pick made his first start, then went two weeks before making his second, a harbinger of things to come. He underwhelmed through nine starts, allowing 17 earned runs on 36 hits and 17 walks in 38 2/3 innings, striking out 39 before going on the DL with shoulder tendinitis. After missing five weeks, Johnson turned his season around upon his return to Greenville—after two rehab starts in the Gulf Coast League, he allowed only five earned runs over 31 innings, surrendering 14 hits and striking out 30 before he was promoted to Salem in late August. He appeared in two regular season games with Salem, allowing two runs on nine hits in 11 innings. He was not sharp in his lone postseason start, but that was not enough to overshadow the strides he made at the end of the season.